How Much Does it Cost to Add Stairs to a Deck in 2019? Adding steps to a new deck or replacing unstable ones on an old one is an essential part of ensuring your deck is safe and sturdy for your household. Adding stairs will make the deck much more functional, allowing access to the rest of your yard. Most will spend $1,000 to $2,000 to add 48″ wide stairs. The size of the stairs will directly affect the price of adding them. Adding stairs to a deck that is 10 feet off the ground will be significantly more expensive than adding stairs to a deck that is 3 feet off the ground. The height of the stairs determines how long the stringers, or the boards that support the stairs, need to be. The width of the stairs is also a determining factor. Stairs should be at least 36″, but making them 48″ will feel less cramped. Wider stairs will require more stringers to support the stairs and more deck boards to finish the treads and risers. Stringers will cost about $3 to $5 per step, per stringer, and a minimum of 3 stringers will be needed, depending on the width of the stairs. The type of deck materials will also impact the cost of adding stairs. Popular materials used for decking in the US include many naturally durable species of timber such as western red cedar and tropical hardwoods. Composite decking is also a great low-maintenance option. One of the top considerations for consumers with regards to deciding on a deck material is the maintenance required. You might think a particular material is inexpensive, but if it needs expensive maintenance rituals every year, it might not be a solid investment. For example, painting and staining a deck can cost $700 to $1150. Similarly, a material that seems to be initially the most expensive might prove to be the best value for money when you consider that it only needs a coat of stain every couple of years. Composite decking and exotic hardwoods will generally cost more than softwoods such as pine and cedar. To determine how many deck boards will be needed to complete the treads for the stairs start with the depth of the tread (how far back the bit you step on goes). Often the deck boards will overhang the tread by 1″ or so, so add that to the depth of the tread. If there will be a space between the boards, subtract that spacing from the depth measurement. Next, divide the depth by the width of the deck boards being used to determine how many boards each tread will need. Keep in mind that often one or more of the boards may need to be cut to fill the space completely. Multiply the number of boards by the stair width to find how many feet of decking is needed to complete each tread. Finally, multiply this by the number of treads to find the total amount of decking needed for the stairs. Filing in the risers of the stairs will also add to the costs. Adding riser boards adds a nice finished look to a set of steps but requires more material and labor to install. Use our deck flooring calculator to find how much decking you’ll need for the stairs. Let’s not forget that deck steps cannot merely be installed standalone. It is very dangerous to install steps without taking into account the fact that you need railings and balusters to go along with them. 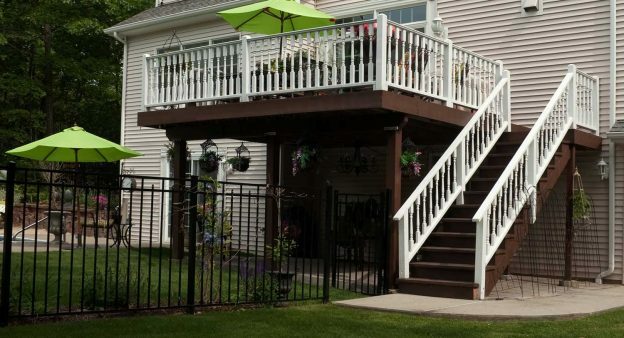 Railings and balusters act as the support mechanism of your deck steps. Ideally, you should have these decorating the entire perimeter of the decking area for both aesthetic and safety reasons. Therefore, when attempting to calculate the cost of adding steps to your deck, don’t forget this essential component of measurement. To estimate the number of balusters needed for a railing, factor in the overall railing length, the number of posts, and the baluster dimensions to find out how many you need for each section of railing. Different railing styles vary in price significantly. Aluminum and glass will be much more expensive than a pine railing with pine balusters. Railings often cost $20 to $60 or more for the materials. Learn more about the cost of building a deck with our deck cost guide.